Although this disc is entitled ‘Concertos and Suites’, and there are indeed two of each, the concerto element is in a sense everpresent, for both suites feature a solo instrument in a manner similar to Bach’s flute-led Second Orchestral Suite. In the booklet, Bart Coen wonders if Telemann’s A minor Suite for recorder and strings could have been a model for that work, and certainly one feels that if a galanterie from the Bach were to pop up in it, it would not sound out of place. Not that the fecund Telemann would have needed the help; ‘the solo suite par excellence for recorder from the Baroque period’ (says Coen) is a good half-hour long without running out of steam. Next to it, the rich-toned G major Suite for viola da gamba and strings is more French and formal in manner, trumpet-like figures in the first two movements notwithstanding. 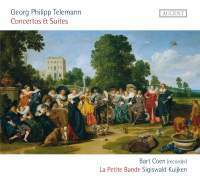 Of the two concertos, the G major is an orchestraless work which on another day Telemann might have called a ‘quadro’, and the A minor is more conventional, despite the unusual but delectable scoring. All four have that charm and skill that seems never to have failed Telemann, and at least three of them have fallen into safe hands here. Sigiswald Kuijken’s long experience, sound expertise in interpretative detail and overall stylistic wisdom are perfect for Telemann, whose courtly ‘light music’ manner seldom lacks a reinforcing vein of bourgeois earthiness. These one-to-a-part performances combine a naturally clear balance with a pleasingly characterful wiriness, and nor are they any less accomplished technically: Bart Coen’s virtuosity consists of a liquid clarity and precision uncomplicated by flashiness, and Kuijken, unexpectedly turning up on viola da gamba, is strong and assured. For me the only real disappointment is the A minor Concerto, here sluggish and over-grand. But that still left me with over an hour of music to enjoy.